Those of you reading this blog more often already know Frank and I had a baby boy in July 2018 which we recently took on his first trip to Greece. Despite being seasoned travelers I was a bit nervous about our first family trip. First of all: how would D. behave on the plane? And secondly: what do I need to pack? When Frank and I were backpacking around the globe in 2015 and on our yearlong trip in 2017, I had a very organised but minimal packing list. We both carried a big backpack and a small day-pack which easily fitted everything we needed. But… how to pack when traveling with a baby? I didn’t have a clue! Our first trip was a bit of trial and error, there were several items I packed but didn’t need (I really didn’t need to pack an entire pack of diapers, turns out they sell these in Greece too;-), but also items I wish I brought with me (like a manual breast pump). In order to help you prepare for your first trip with your baby, I have asked experienced family travelers and bloggers which item they never travel without when going on a family vacation. 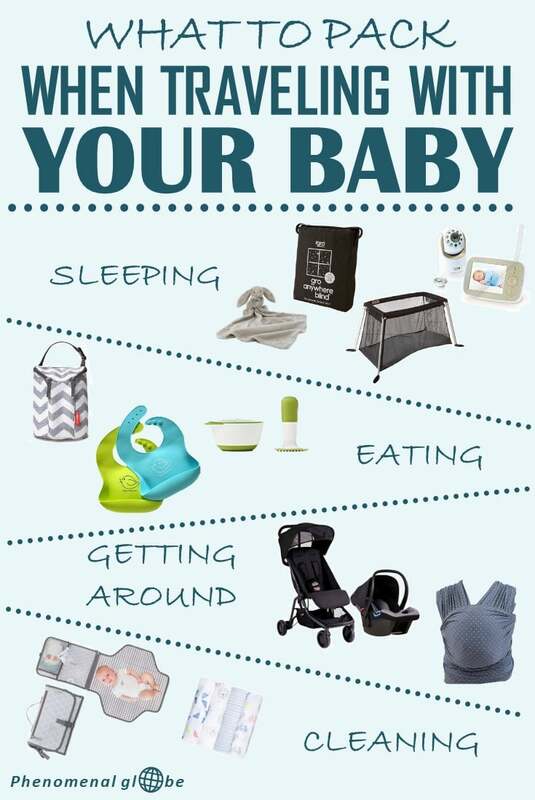 Read on for the complete packing list for baby’s first trip! First and foremost, we care about our baby’s health. If your baby gets sick when traveling, the last thing you want is having to look for a pharmacy in a strange city. Therefore, be sure to pack these items! Shari from Diary of a SoCal Mama never travels without a first aid kit for baby. “Being exposed to new places and new germs could cause your baby to get sick. Be sure to pack a little first aid kit for your baby and include your pediatrician’s phone number, as well as the after-hours nurse line, in case your baby gets sick while you’re away from home. Your first aid kit should include things like nail clippers (if you aren’t flying), baby Tylenol (read more below), Nose Frida or another nasal aspirator, diaper cream, baby thermometer and gripe water or gas drops in case of an upset tummy. Click here to buy a first aid kit for your baby. Clare from Epic Road Rides also makes sure never to travel without baby paracetamol as it’s helpful for a variety of baby-related woes, from temperatures to teething. “One item I would highly recommend that every parent takes on a first trip is baby paracetamol. You can buy it in a variety of different bottle sizes, including 100ml so you can get it through airport security. You can even get it in little 5ml sachets; while this isn’t as cost effective, it saves you from lugging a large and heavy bottle around. Sleeping at a strange place can be difficult for your baby. Luckily, there are several items you can bring on your family trip to make falling asleep easier for your baby. One of the first items Suzi from Survey Suzi packs for trips with her baby is a travel crib. “Having your own crib can help baby sleep so much better and makes travel less stressful so I see it as essential. Often hotels do have cribs available, but this is never guaranteed and the quality can be questionable especially if you are traveling internationally. Pro-tip: it can be smart to get your baby used to the travel crib before your trip, set it up at home and let your baby take his or her naps in the crib for a week or so. This way, the travel crib will soon feel (more) familiar to your baby and he or she will fall asleep more easily. Katrina from Mama’s Organized Chaos considers her video monitor an essential item when traveling with her baby. “When I first got pregnant, I’d decided we didn’t need a video monitor, or even a regular one for that matter. Our house was small enough that we’d be able to hear our baby. However, we ended up finding a video monitor for a great price and decided to give it a shot. I fell in love and now I even travel with it! We prioritize sleep in our house big time, and in my experience a baby that can see you is a baby that doesn’t sleep very well, because he or she is distracted. So when in a hotel, we create a nice cozy spot for our baby with zero visibility of mama and daddy. We use the closet, the bathroom, or a little nook with a blanket hung up, whatever works. And, in order to be able to see the baby and make sure the baby is sleeping, we set up the video monitor. If you don’t want to bring a video monitor on your trip, but do want to keep an eye on your sleeping baby, Celine from Baby Can Travel recommends the Baby Monitor 3G app. “One item we always make sure to have when we travel with a baby or toddler is a baby monitor app on our devices. We typically try to stay in Airbnb apartments or hotels where we can have a separate room and want to have the comfort of knowing that we can check in on baby at any time. 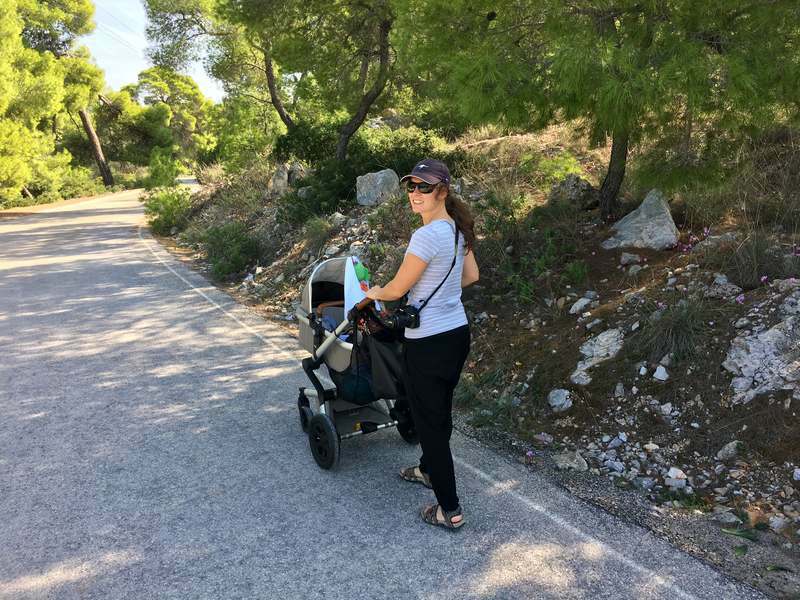 Marta from Learning Escapes also has a favorite family travel gadget, one she uses extensively when travelling with her babies. “We learned about portable travel blinds for use in the house, but quickly realized that they were an excellent item to carry when away too. Particularly in situations when we had little control over the brightness of hotel rooms or rental apartments. Portable blinds are designed to be lightweight and easy to fold. The blinds operate with suction cups that stick to glass surfaces and don’t leave any marks, so you don’t have to worry about asking for permission or damaging surfaces. Leah from An Adventure Is Calling loves her portable white noise machine. “Our Marpac Rohm portable white sound machine is compact and battery-operated, which makes it easy to travel with. It has an excellent battery life that has lasted us for days. Our baby sleeps with it on vacations, but we also use it in the car and even the baby carrier when she takes naps out and about. The machine comes with three sound options, and its adjustable volume options range from very low to very high (which is excellent on city trips when outside noise can be a big issue). The volume can go up much higher than the traditional, plug-in white noise machines that we have used at home. There are several ways to get baby around when traveling, read along for travel tips from experienced moms and dads! Melissa from The Family Voyage never travels anywhere without a proper car seat for her kids. “One of the most important things to pack on your first trip with a baby is a good travel-worthy car seat. Airplane seat belts are designed to restrain passengers 40lbs and up, taxis rarely offer car seats, and rental car companies are notorious for providing the wrong type of car seat. Therefore, your best option is to bring a car seat that you know and trust with your child’s life. Obviously a car seat is important as a safety device and having one that’s lightweight and easy-to-lug can be the difference between a back-breaking, sweat-inducing trip that makes you want to stay home for the next five years and cruising through your flights like the seasoned pro you’ll soon become!For young babies the simplest choice is to bring an infant car seat (capsule). Once you child outgrows that seat, there are many choices available and the best option is unique to each family’s budget and specific needs, you can read more about the right travel car seat for your child here. Amoya from Trippin’ Momma found a solution to lugging around the aforementioned car seat, a car seat trolley! “A car seat trolley is an absolute must for traveling with babies. As a full-time traveling single momma of 3, I often have my hands full and car seats can be (very) heavy. Getting a car seat trolley was an absolute game changer! I can put my little one in the car seat attached to the trolley and basically use it as a stroller throughout the airport. Melissa from Thrifty Family Travels recommends to bring an ergonomic baby carrier. We have been travelling with our daughter since she was a small baby and found a quality baby carrier one of the best items to travel with. The type of carrier depends on the sort of travel you do will, but we found just a simple sling worked well for us. Having a baby carrier or sling is not only great for using once at your destination, but also perfect for on the plane. I felt much more secure having my daughter in the sling when on the plane. I had my hands free to read a book and also knew she was secured if I happened to drift off to sleep. We traveled a lot to South East Asia with our daughter when she was a baby, and the pavements there are not always well suited to strollers. So having a sling made it easy to carry her around during a day of sightseeing. David and Faye from Travel With Little One highly recommend to bring an umbrella stroller. “One of the most essential items we bought for our baby’s first trip was an umbrella stroller. It is very light, portable, easy to use and folds away very quickly, while providing sufficient support for a child over a few months old. We decided to buy one for use in the airport and around our destination city. Before leaving we checked with our airline and airport (Qantas, Heathrow) whether or not we could take the umbrella stroller through to the departure gate, and were delighted to find we could! We were then able to retrieve our stroller just after leaving the aircraft at our destination, and use it to push our little fellow down to baggage retrieval. This made such a big difference to us! We were able to transport him around the airport easily and quickly, with the minimum of effort. Otherwise we would have had to carry him for two hours before boarding. Note: the Babyzen YoYo stroller is accepted as cabin luggage by most airlines, making it even easier to travel with your baby! Mel from Traveling Mel stresses the importance of bringing a quality backpack that can be used as a diaper bag. “There are a lot of essential items to take on baby’s first trip and you need something great to carry them all in. A carry-on sized backpack makes it easy to have your little ones must-haves with you at all times. And, since it is a comfortable backpack, you have both hands free to push a stroller or hold a hand. You can even use a good travel backpack with a baby carrier! We used Osprey’s Porter travel backpack when our kids were little, and the great thing is, we still use it today. The U-shaped opening makes it easy to access everything and the compression straps cinch the pack down to make it more compact. Jane from Fun Things To Do In Melbourne recommends carrying a good quality changing mat when traveling with your little ones. “A changing mat that is small enough to pack is essential when travelling with a baby. We always used one for changing our babies in public areas and especially on hotel beds to keep everything clean and orderly. Ours had little pockets where we would always store a small packet of wipes, nappy bag and a spare nappy. When a nappy change was needed, we could just grab the one item and the task was so simple. Elaine and Dave from Show Them the Globe make sure never to go on a trip (or leave the house;-) without a couple of muslin cloths. “Muslin cloths are an essential for us when travelling with our baby. We never understood why so many parents recommended muslin cloths until our baby arrived and now those light sheets of muslin accompany us everywhere! Muslin cloths are super versatile and we use them for everything from burping the baby and covering surfaces to protecting cloths during feeding. They’ve saved many outfit changes on our travels and are super absorbent for spillages on the go. 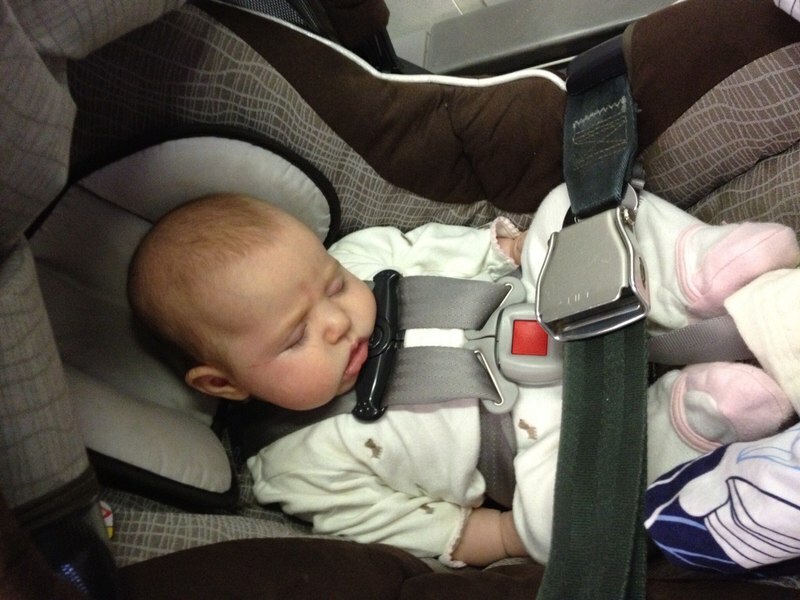 Jana from Mommy’s Little World always carries at least 5 pacifiers in her diaper bag when traveling abroad with her baby. “There are many things you should pack when taking your baby for a trip for the first time, however, pacifiers and pacifier wipes are the number one on my list! You can buy more diapers, wipes, clothes, but a pacifier your baby loves can be a lifesaver that can’t be easily found in every city. I learned from my own experience that some stores simply don’t carry the brand your baby likes and babies can be picky, especially when traveling! Lisa from Flip-Flop Globetrotters always carries a diaper pouch when traveling with her baby boy. “Everyone who travels knows how important it is to keep your stuff organized and the same goes for your diapers! How often do you have to hunt for those illusive diapers you’re positive you stuffed somewhere in that overfull day-pack or carry-on? Now imagine you have your diapers in a brightly colored and easy to find diaper pouch, together with the wipes. No more loose diapers cluttering your bag and it’ll become routine to stock your diaper pouch so you’re never without. Very practical to change your little one on the go. Sandra from The Smarter Writer has a great tip based on her own not so great first flight with her baby: besides carrying an extra outfit for your baby make sure to pack an extra set of clothes for yourself in your carry-on baggage as well! Most parents will pack extra clothes for their baby, but often forget to pack an extra t-shirt and leggings or pants for themselves in their carry-on baggage. He is prone to spilling drinks or accidentally knocking his meal in the direction of my lap. Long flights are hideous enough as it is and the last thing I want to deal with is being uncomfortable in soggy clothes. Feeding your baby while traveling can be a challenge. You want to provide your baby with healthy food, clean bottles and you don’t want to make a mess in (fancy) restaurants with s squirmy baby on your lap. Here are several items to make your life easier when feeding your baby on a holiday! “Silicone bibs are amazing because they have a handy lip that catches even the goopiest of foods. They are super easy to wipe and clean, even in small cruise ship sinks. After our first big trip with our 10-month-old son to Paris we were so glad that we brought two of these clever little bibs. Chris and Linz from More Life In Your Days consider a travel chair harness essential when traveling with their little girls. “One of our travel essentials when travelling with a baby is our chair harness. This clever, compact piece of kit can turn almost any chair into a safe seat for your baby. This is great when you are travelling as you never know whether the restaurants will have proper baby high chairs or not, with this harness you have your own alternative to having them on your lap throughout the meal. It is ideal for babies that are able to sit on their own but are not yet too mobile, in our case this was around 8 months to just over 1 year. A fairly short time period but it proved invaluable on our trip to Thailand, Cambodia and Vietnam. Ketki of Dotted Globe has a clever travel item for your baby’s first trip as well. “I highly recommend packing microwave steam sterilizer bags while traveling with younger children. Each of these bags can be used more than once to sterilize baby bottles and parts. However, I have also used them to sterilize everything from pacifiers to sippy cups while traveling with my kids. Jessy from Planet Pilgrims highly recommends to pack a small cooler box for family trips. “When I took my first road trip with my daughter for an overnight trip, I’d just adopted her for about a week and she was about 4 months old. We live in South Africa and December is one of the hottest months. Of course I wanted this road trip to go as smooth as possible. Having bottles with formula ready to hand to the back of the car seemed a logical thing to do. Allan from The Practical Saver is a fan of a manual baby food grinder. “It’s a great idea to bring manually-operated baby food maker. For parents who like to travel and still want to give their babies fresh and unprocessed foods even when on the go, a portable baby food maker is a must. One thing several mums agree upon: it’s very important to keep your baby occupied when traveling! Depending on the preference of your baby, you may want to consider bringing one of the toys described below. “Our favorite item for baby’s first trip is the Dingly Dangly Donkey toy by Playgro, as it has entertained our daughter from newborn to 9 months and she stills loves it. Donkey provides hours of entertainment and is visually stimulating to babies as the toy has bright colors and patterns and engages babies visual perception skills. The toy engages babies sensory needs as well as there is a squeaker inside and the feet acts as rattles. It’s soft and has many different parts for baby to grab on to. “What ever you do, don’t forget to pack your baby’s favorite blankie that they cuddle to comfort themselves with before falling asleep! On our first trip away with my daughter we did forgot to pack her favorite blankie. All the way to our destination she was unsettled, which we put down to her not enjoying the journey. But after an extremely unsettled night for her, us and probably the neighboring villas too, we realized we had forgotten her special blankie. When taking baby on a trip, Mary Beth from MB Sees recommends bringing along a toy your baby hasn’t seen before to keep him or her occupied. “My pick for the best item for baby’s first trip would be a brand new (well, new to the baby) multi-sensory toy. When we took our son on his first flight, we brought along a stuffed octopus toy he’d never seen before that had bright colors, multiple textures, and a different accessory on each leg. After he got tired of playing with his familiar toys, the octopus kept him busy for hours! There were rattles to shake, rings to grasp and, most importantly, there was a mirror to look into. The accessories completely captivated our son’s attention and his reflection mesmerized him to no end. He played quietly for the entire flight! Lisa from The Schooled Parent always brings packing cubes to stay organised on a family trip. 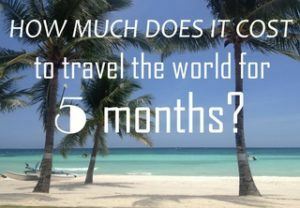 “We recently traveled overseas with our (then) 6-month-old and 2-year-old. One of the best items we packed for our first trip with our babies were packing cubes! We used the cubes both in our checked and carry-on luggage, to help us stay organised. With the packing cubes, we were able to keep things separate and easy to grab. This is especially convenient when you quickly need to find something on a flight. For example, we had one cube for nappies and wipes. So if we needed to change a nappy, we could just grab the cube and head straight to the bathroom. Miriam from The Very Best Baby Stuff recommends a toy tether when traveling with a baby, because it has so many uses. “I like to attach a toy to each end to make it easy to find the toys in my diaper bag, and also to prevent them from rolling down the aisle on a plane or train. You can also use one to tether a bottle, pacifier, sippy cup, toy or even food pouch to your baby carrier, stroller or high chair to prevent them from going overboard. Kaylie from Happiness Travels Here always makes sure to bring ziplock bags when traveling with her babies as they have so many great uses. “Choose sturdy ones that seal well and they can be used over and over again. A large zip lock bag is the perfect vessel for sterilizing bottles or pacifiers on the go, fill with water and add a Milton tablet. Ziplock bags can also be used like packing cells to sort and separate when you are packing, keep socks in one, undergarments in another and charger cables organised in another. Use the bags to protect important documents and passports from the inevitable spills that you have when travelling with kids. I always have a couple on hand around meal times, to store some left-over fruit, vegetable sticks or bread rolls for you or baby to munch on later. The food will stay fresh and take up less room than bulky containers. Kelly from Travelling Mama recommends bringing a mosquito net for your buggy when travelling to a hot country or somewhere where mosquitoes are likely to be present. “A mosquito net is a thin mesh material which is elasticated around the edges to slip comfortably over a babies buggy. The net is breathable and see-through, so you can still see your baby inside. You can also use it for baby’s bassinet or travel cot on a night. Babs from Travel Gear For Kids has another great item to add to your baby travel packing list: a waterproof baby sling! “Wondering how you are going to bath your newborn while traveling? It is entirely possible to take a portable bathtub, but an easier option might be to bring a waterproof baby sling. It is much more compact and you simply put it over your head, put your baby in and step into the shower. A waterproof baby is made from a lightweight mesh fabric, this way it dries easily. As an added bonus you can use it in the swimming pool or on the beach as well. Put your baby in the sling and you can play in the water while keeping your hands free for their siblings. Chontelle from Mum’s Little Explorers recommends bringing a great camera to take plenty of pictures of your baby’s first holiday. “If you are heading away for your baby’s first trip, one important thing that you can’t forget to bring is a camera to capture those precious moments! Whether it is the first road trip, first train ride, or first flight, those milestone photos of your little one will be something to look back on in years to come. Rachel from The Analytical Mommy has a great idea to make the pics of your first family trip even more memorable. “One of the most fun items you can bring with you on your baby’s first trip is a chalkboard or letter board! During those first few adventures, your baby will get a chance to see some amazing new sights and I’m sure you want to document them, right? A chalkboard or letter board is small and light enough to carry almost anywhere, and will let you take some of the cutest baby photos ever! Imagine sitting your little one in front of the Eiffel Tower with a little chalkboard next to them saying something like ‘First ride up the Eiffel Tower – 7 Months Old’. If you pack these baby holiday essentials, I’m sure you are well prepared for your first trip as a family. Also read my posts about the best cities to visit with kids in East Europe, West Europe, Scandinavia and the U.K.
And while I found traveling with a baby definitely very different than backpacking with my husband, I absolutely loved it! It’s just great to explore exciting new places with the people you love, be it your partner, children, parents or friends. 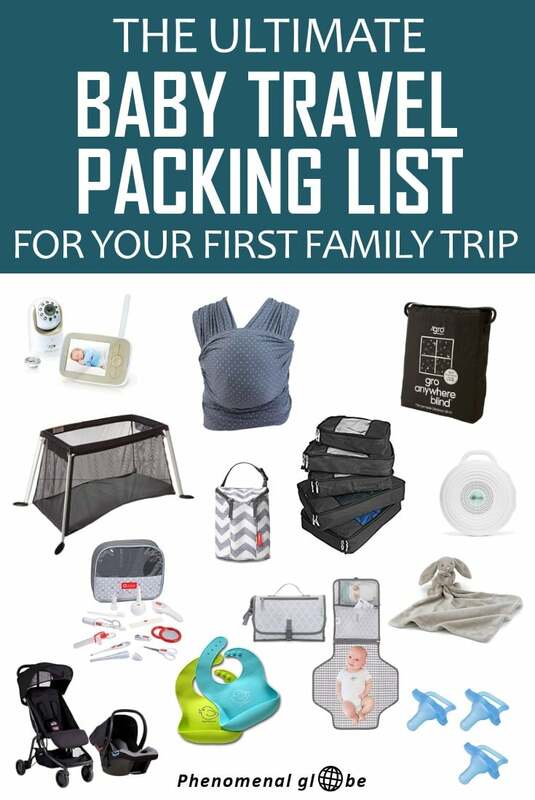 You can download this baby travel packing list below, happy travels! 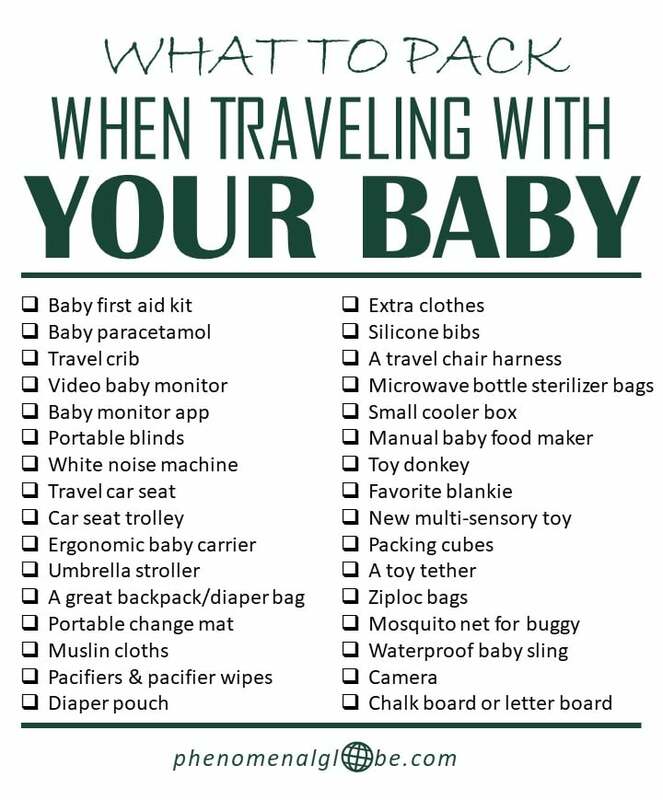 This is the best list for packing to travel with a baby. Thanks for putting together so many excellent ideas.